I recently obtained a Hanwei sidesword blade with home-made hilt furniture that I really like the look and feel of. It has a knuckle bow, a crossguard and a couple of finger rings. It looks more than a little reminiscent of a Meyer Rappier; so I decided I’d call it just that and start reading the Rappier/Sidesword section in Meyer’s Art of Combat. I like the style so I thought I’d give learning it a go. 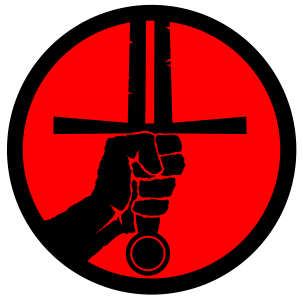 In this weeks post, I use the sword, the treatise and the puffy pants as jumping off points to discuss practical and philosophical aspects of historical fencing that stretch beyond Rappier alone. I want to try out learning from a historical source with a minimum of direct coaching or instruction. To me, this is what makes Historical Fencing what it is. Reference to the source material, experimentation with and interpretation of techniques as described by users contemporary to the weapon, individual study and paired practice. All leading to an imagined state of competence. I imagine that this is similar to what happened in the very early days of HEMA. I’m not suggesting that I am doing any original scholarly work here, I am grateful for the translations that are now available and the giants upon whose shoulders I can stand. It is just that I would like to venture into a new style with no hand holding (or at least a minimum). I have one other member of the club who is interested in the style, no surprises he was the one who welded up the guard for me, so some paired practice will also be possible. The Hanwei blade is a little inflexible so some care will be needed in thrusting and I will most likely add a blunting device to the tip. Most importantly I am going to learn to fence with control and an understanding that I’m not actually trying to hurt my opponent. Too many people I have faced in ‘friendly’ sparring seem to feel the need to demonstrate their ‘skill’ through inflicting damage on me. It’s understandable that in a ‘martial’ situation your approach may be different. If your blow is parried you make your next attack with slightly more force in the hopes that you can overcome the next parry. This continues until you break the parry and land a telling blow. In a sparring or demonstration setting using this tactic to ‘win’ makes you an unwelcome partner. If I manage to parry the first and second, my failure to parry the third has usually led to bruising and a good deal of resentment. Logic dictates that I simply allow the first strike to hit; thereby minimising the force and the potential damage. Well done, you have just won a non-competitive situation through the use of violence and ruled me out as a future sparring partner. Getting beaten is nobody’s favourite pastime and some may see this as a bit of whining, maybe but there is a real safety issue here. Force can be used to win binds, displace blades and force errors in your opponent. However, it is our responsibility to our partners and ourselves to use force appropriate to the situation we are in. Inadvertently receiving (or even deliverying) a bruise in the course of an otherwise well controlled and interesting exchange is no bad thing; you quickly get to learn where the gaps in your defence are and hopefully prevent them in future. Still, the person who bruises you should also look at their own technique. It should be fairly obvious that regular injury (even minor ones) indicate a lax attitude toward safety and what can only be thought of as slightly ‘dickish’ behaviour in the context of a friendly training environment. I have said it before that you are never going to chop someone’s leg off with a blunt blade; so it still stuns me that people seem to be trying to do exactly that. “I hit hard because I’m moving my blade quickly” or “My cutting mechanics are so good that I generate that much force without realising it” are just excuses for not being in control of yourself or your weapon and using force excessive to the situation. Saying anything along the lines of “it’s the only way you’ll learn” is, to my mind is just ridiculous. We’re not being moulded to fight in deadly combat, our instructors should not intentionally use pain and risk as a teaching tool. In the introduction to the book as a whole Meyer states that the written word should be used to refresh the memories of students once they have been given some direct instruction from a ‘master’ (B1r, Foreword to the Reader). So that gives me an excuse to watch videos on YouTube of people who know what they are doing and copy them, right? Absolutely it does. Videos are the 2018 equivalent of secondary sources. People have gone to great efforts to read, understand and interpret treatises and make their work available for others like me. Using the two types of sources in combination makes a lot of sense to me. I love reading the manuals but have found that when I am unable to make sense of a technique, watching someone else’s interpretation can remove the blockage. In the final analysis, I may not do exactly what they do, nor exactly what the book says but the option to see experts is invaluable. I know I am probably preaching to the choir but online guides and courses are your friends. Given the huge number of them and the accuracy to which they can be searched the biggest problems are knowing which ones are valuable and frankly, knowing when to stop watching and get back to study and training. I have to admit that I am short-cutting a little, as I am already familiar with the ‘German’/Liechtenauer tradition by way of ‘Döbringer’, a scattering of Ringeck and a bit of Meyer longsword. My reading so far has led me to believe Meyer’s rappier really is just “one-handed-longsword”; which is a term that gets bandied around the Wrathful Peasants in reference to everything from sabre to wooden spoon fencing. I am totally staying within a tradition I am already familiar with. I am a little daunted by the prospect of learning a whole new terminology at the same time as a new style, so I opted to steer clear of the ‘Italian’ sidesword schools. Call me lazy if you want, but I have made my choice and I am sticking to it! That’s the sword and the treatise covered now on to the puffy pants. More intellectually, let’s talk about making your fencing look right. In our heads, we each have a vision of what we should look like whilst we fence. This touches on both our internal motivations (i.e. who or what we are trying to emulate) and how we judge the quality of our fencing. We have all seen fencers who, no matter how effective they are, don’t look the part. Their posture, the way they hold themselves before, during and after striking, just doesn’t sit right. Maybe we can see that their knees and toes aren’t in alignment and they look unstable, maybe their wrists articulation looks like a tendon strain waiting to happen. Somehow we are able to turn arguably aesthetic judgements into an understanding of whether they are doing things ‘correctly’. I think it is our innate understanding of ‘body mechanics’ (a problematic term in itself) that allows us to see at a glance when a technique is being executed incorrectly. We can imagine our own bodies in that configuration and say ‘jeez, their knees must be hurting!’ or ‘The way their toes are pointing in will seriously compromise their reach in thrusts’. Maybe this isn’t truly innate, maybe we have to learn an internally held ideal, that we compare our own posture with and by a sort of ’empathic’ process we can see when others are getting it wrong. We may be completely wrong as it happens, but by and large, if something looks right then it most likely is right. This is especially true of the Meyer systems because of the excellent and iconic woodcuts that conclude each section. The treatise itself has given us that ideal to aspire to. This is better, with all due respect to good instructors than a mere description. The image in the book is always going to be the same, it doesn’t depend on whether a demonstrator gets it right or whether you pick it up in the 30 seconds they are willing to hold it. When I use a Schielhau I am mentally comparing the results with Image G, just as Meyer says I should. Is my thumb on the Schilt, did I use the false edge and why isn’t there a little doggy on the step? Now, I totally see that there is room for interpretation… Is the Schielhau guy’s left foot actually on the ground? How much farther can I extend my arms toward my opponents face and still match the exemplar? Have you noticed how often the leading foot doesn’t actually point at the opponent, despite what all instructors seem to say, or is that just me? All good questions and all have to do with my understanding and approximation of a fixed, learnable ideal. Enough of that, the point is that I wanted puffy pants because that is what the dudes in the Meyer woodcuts are wearing, I want to do my fencing like they’re doing and I want it to look like I am as well. Aesthetic needs are an extension of my desire to be competent, in this case at least. I will, of course, be updating you on my Rappiery progress. I may even get some pictures of my attempts as well. I hope you have enjoyed my wafflings again this time around. If you did, please share it as widely as you like. You can reach me via the comments section below or on the Wrathful Peasants facebook page. Previous Post Pros and Cons of competition. Next Post Attending Big Events gets you buzzed for HEMA!